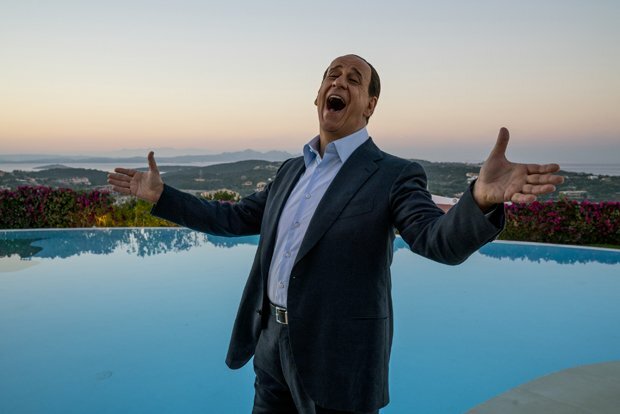 Paolo Sorrentino's gaudy Silvio Berlusconi saga is exuberantly pitched between grand opera and Shakespearean tragedy. Loro (Them) is a typical Sorrentino production: a flashy, baroque, wallow in the sleaze and corruption that once swirled around Mr Bunga Bunga. Yet, this is a film that tries to understand Berlusconi rather than condemn him. Distilled from a brace of Italian films, the international version of Loro initially focuses on small time pimp Sergio (Riccardo Scamarcio) and his dreams of access to Berlusconi's world. That world is depicted in all its sordid Eurotrash glory. Himalayas of cocaine are snorted, women are traded like cattle and the relentless misogynistic hedonism is wearying. The first appearance of Berlusconi (regular Sorrentino collaborator Toni Servillo) doesn't come until over 40 minutes into the film. Exiled from power (the film begins in 2006) and bored with life, he cuts a forlorn figure as he prowls his Sardinian island paradise. Sporting oil-slick hair, an Irn-Bru tan and fixed smile, Servillo is a dead ringer for Berlusconi. He captures familiar mannerisms but also manages to find the humanity in him. This Berlusconi is a combination of Charles Foster Kane, Willy Wonka and Willy Loman as he laments the emptiness of having it all and asserts that his greatest skill lies as an irresistible salesman. One bravura scene has the old rogue showing he still has 'it', as he cold calls a wary housewife and charms her into purchasing an as yet unbuilt home. A blithe spirit, endlessly conceited, Berlusconi is implacable in the face of criticism or the collapse of his marriage to the battle-weary Veronica, played by a terrific Elena Sofia Ricci. Loro is a sprawling, unexpectedly melancholy film. Sharply entertaining in places, it only seems to scratch the surface of a complex life and the country in which it flourished. Selected release from Fri 19 Apr.